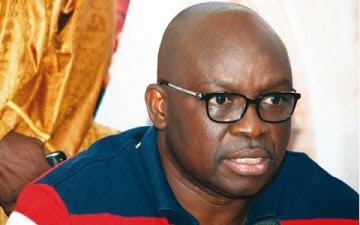 "Ekiti State Governor, Mr Ayodele Fayose has said that the All Progressives Congress (APC) and its presidential candidate, Major General Mohammadu Buhari (rtd) no longer have moral rights to participate in the March 28 presidential election having lied to Nigerians on several occasions. According to a press statement issued in Ado-Ekiti by his Special Assistant on Public Communications and New Media, Lere Olayinka, the governor noted with dismay the contemptuous manner in which the APC and Buhari hold Nigeria and its people. The governor, who vowed that Nigeria will never be ruled by deceit, said; "In saner climes, you can't lie and be discovered to have lied repeatedly as done by the APC and still want to stand for elections." He said; "The new deceit from the APC is to use a photoshoped picture of Buhari for posters in Lagos, making him look like a 50 year old man, whereas he is as old as my mother and cannot survive the rigours of office even as a governor not to talk of President of Nigeria." He noted that it was appalling that despite being found to have lied on several occasions, the APC has never deemed it necessary to apologise to Nigerians for trying to deceive them. His words; "First, the APC Vice Presidential candidate, Prof Yemi Osinbajo, a supposed pastor posted picture of Reinhard Bonke crusade on his Twitter Handle, claiming that the picture was that of APC campaign rally in Kano. "Second, the APC claimed that Buhari made a surprise visit to Chibok and went further to lie that the people and parents of Chibok girls were filled with hope and joy upon sighting Buhari and his entourage, and escorted him into Chibok with singing and dancing. "Third, the APC cabal claimed that Buhari travelled to the United Kingdom on a working visit and used fake pictures to back up their lies that Buhari met with ex-British Prime minister, Tony Blair and had a television interview in London. "Even when Buhari's wife admitted that her husband was in the UK to rest, the APC cabal went on with their lies, using pictures taken in Transcorp Hilton, Abuja as proof of Buhari's activities in London. "If a party and its candidate could lie so brazenly as done by the APC and Buhari, do they still have moral rights to want to rule Nigeria? "God forbid, can Buhari and his APC cabals that are not truthful about their existence as human beings be trusted to be truthful to Nigerians if they take over power?